The widow of India's most notorious bandit, Veerappan, says she wants the courts to ban a new television series portraying the life of her husband. Muthulakshami said that the programme would traumatise her two teenaged daughters as well as turn them into social outcasts. The series entitled Santhanakaadu, or Sandalwood Forest, is due to be broadcast from 15 October. Veerappan killed more than 100 people before being killed by police in 2004. Muthulakshami lost an appeal in a court in Tamil Nadu state to have the broadcast of the series stopped. She says she will now file a case in the state high court. "The directors [of the series] talked to me as friends and recorded everything on micro tape without my knowledge," she said. "They know about my life and Veerappan's life, which will be telecast as a serial. We cannot allow this," she told reporters. But the director of the series, V Gauthaman, says her fears are unfounded and that the series will win the family some sympathy and goodwill. "The series focuses on the positive side of Veerappan," Mr Gauthaman told the BBC. "It describes the circumstances that led him to become a bandit. It depicts him as a sort of a hero that he was, to many people." The makers of the series say the chronicle is based on extensive research on Veerappan's life. The television crew spent more than 100 days shooting in the Sathyamagalam forests where Veerappan roamed for more than three decades before he was killed by police. 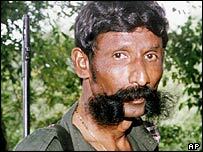 Veerappan was a tall, wiry bandit with a long twirling moustache. He used to wear military camouflage and had a bounty of five million rupees ($127,779) on his head. He hit international headlines when he kidnapped an ageing film star, Rajkumar, and held him hostage for more than 100 days in 2000. Two years later, he was in the news again for kidnapping a regional politician, H Nagappa, from his farmhouse in Karnataka. Mr Nagappa was later found dead. Veerappan denied responsibility for the death, accusing the police of killing him in a shootout. The authorities denied the charge.